AT II ବା ଆଞ୍ଜିଓଟେନସିନ II Na+, H2O and HCO3− ପୁନଃ ଅବଶୋଷଣକୁ ଉତ୍ତେଜିତ କରାଏ ।. 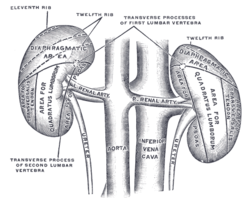 ↑ "HowStuffWorks How Your Kidney Works". ↑ "Kidneys Location Stock Illustration".